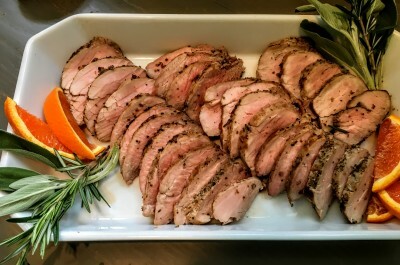 Many years ago during a trip to Italy, I remember stopping at a roadside stand somewhere near Florence to buy “porchetta.” From my first bite of this intensely flavored grilled pork, I was smitten. The porchetta (pronounced por-ket-ah) was prepared with a whole boned pig that was stuffed with garlic and herbs, then rolled, and cooked slowly on a spit. Vendors served the fork-tender pork as an exquisite sandwich layered between bread slices. Like Memorial Day and July 4th that precede it, Labor Day is a holiday celebrated casually. For the last of that triumvirate of summer fêtes, most cooks (and I am certainly one of them!) will be pulling out grills, cooking burgers, steaks, chops–you name it–over open flames. 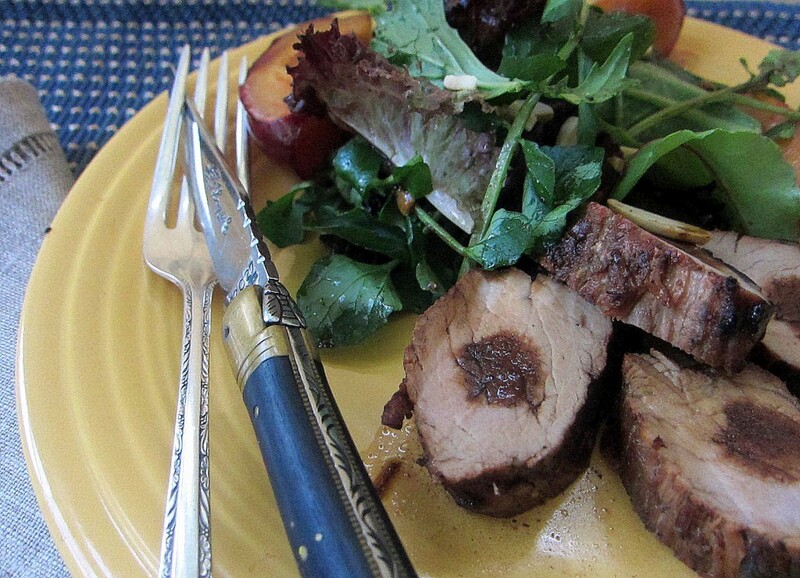 I’m especially excited about my menu this year since I’ve been fine-tuning a recipe for grilled pork tenderloins and plums served with a verdant summer salad. Nothing could be easier. 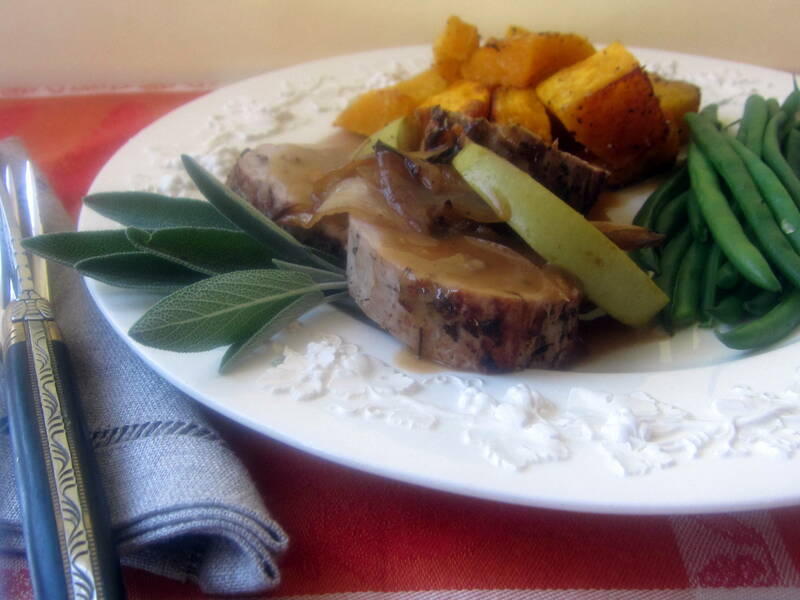 The tenderloins are marinated in a simple mixture of balsamic vinegar, soy, and canola oil with generous seasonings of fresh ginger, garlic, and black pepper. If you have enough time, it’s best to marinate the meat overnight, but in a pinch you can let it rest for several hours. Grilled over a hot fire, the meat needs 20 to 25 minutes until fork tender and the flesh blush pink. 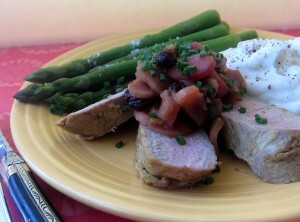 During the last few minutes, juicy plums, quartered and skewered, are cooked quickly alongside until slightly charred. The thermometer has reached into the 70s, the forsythia are at last in bloom, and sleek, long crimson rhubarb stalks are proudly displayed in our groceries. Spring has at last arrived in New England!